But, back to work! 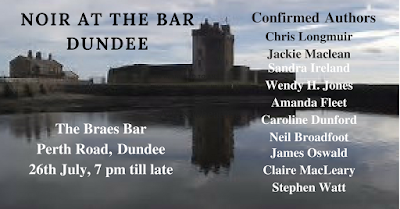 I have a book event tomorrow - Noir at the Bar in Dundee - which should be a great laugh. Entry is free, there are a heap of us there, you get to hear a bit from each of us and there's a chance to win a free book. What's not to like? If you're in the area, come along! After that, I have some Murder and Mayhem dates organised - a group of writers will be doing events with a twist! We might be doing a murder-mystery play or we might be doing an improvised story built line by line, based on whatever the audience shout out. It could be murder... it could very easily be mayhem, but either way, it will be great fun. Full dates to follow!